Federal Reserve Chairman Jerome Powell said the job market should remain strong "over the next several years." 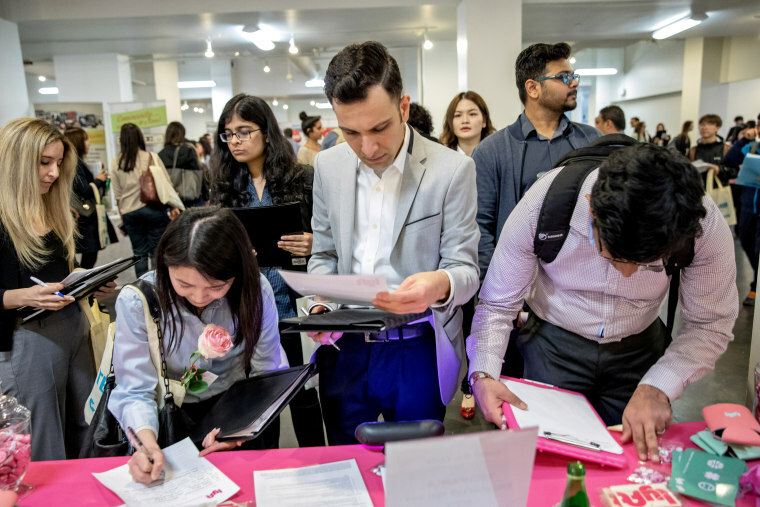 The number of Americans filing for unemployment benefits unexpectedly fell last week, hitting its lowest level in more than 48 years, as the labor market continues to strengthen. Other data on Thursday showed manufacturing activity in the mid-Atlantic region accelerated in July, driven by a surge in new orders received by factories. But manufacturers reported paying more for inputs. They were less upbeat about business conditions and capital expenditures over the next six months, a sign that import tariffs were starting to hurt business sentiment. Initial claims for state unemployment benefits dropped 8,000 to a seasonally adjusted 207,000 for the week ended July 14, the lowest reading since early December 1969, the Labor Department said. The second straight weekly decline in claims, however, likely reflects difficulties adjusting the data for seasonal fluctuations around this time of the year when motor vehicle manufacturers shut assembly lines for annual retooling. With manufacturers undertaking the retooling exercise at different times in July, this can throw off the model that the government uses to the smooth the claims data for seasonal variations. The economy created 213,000 jobs in June, with the unemployment rate rising two-tenths of a percentage point to 4.0 percent as more Americans entered the labor force, in a sign of confidence in their job prospects. Federal Reserve Chairman Jerome Powell told lawmakers this week that with appropriate monetary policy, the job market will remain strong "over the next several years." Employment gains averaged 215,000 jobs per month in the first half of this year. The labor market is viewed as being near or at full employment. There were 6.6 million unfilled jobs in May, an indication that companies cannot find qualified workers. That was reinforced by the Fed's Beige Book report on Wednesday showing worker shortages persisting in early July. The U.S. central bank said the scarcity of workers was across a wide range of occupations, including highly skilled engineers, specialized construction and manufacturing workers, information technology professionals and truck drivers.